Thank you for the Eczema Cream I have tried many products for our 2 year old son and have found this to be the best one so far, it keeps it at bay and provides him a relief. He actually asks for it to be put on when he starts scratching. We would recommend people to try this product. It’s worth every cent and the best part it’s natural. Please could we order 6 more pots of Arthritis Cream. We are loving your products. The trial one of aches and pains was very good although not really a lot different to the sports rub. We are now getting people coming in just for the creams. Our 3 year old son has skin rashes and hives and we have been treating him with your eczema cream. We will certainly visit your Hoopers Crossing store. I have recently had the opportunity to try your insect repellant. I must have the chemistry that attracts “bugs” of all sorts. I have therefore been using very strong repellants (with some concerns) I have found your product to be excellent in repelling mites and fleas. I will trial it against mosquitoes and flies in the near future. I wash the insect repellant off after a few hours so I do not know yet if it has a any irritation to the skin if left on for longer periods of time. All the best with your future business. I Tried your product Arthritis Cream a sample of which was delivered to my workplace Clarence Joint Therapy in Howrah some few weeks ago. I found it to be very kind to my arthritic fingers and was wondering how I go about purchasing a jar of it for myself. You have the Greenstore at Howrah and Lauderdale Larder listed as a retail outlets but both of these shops have been closed for some time. I would be grateful if you could let me know where to buy it. The physiotherapists and massage therapists at West Tamar Physiotherapy have been using Ocean Omegas products exclusively for the last 12 months. We use them tipically for massage, and as a precursor to Ultrasound Therapy. They have natural healing qualities, including those from Omega 3 & 9 oils, that clients have responded well to. We have found the products to be both effective in it’s results with clients, and gentle on the skin for continued use during the day. (other products can leave the hands itchy and irritated when used continually). This is due to the natural healing qualities of Ocean Omega products. 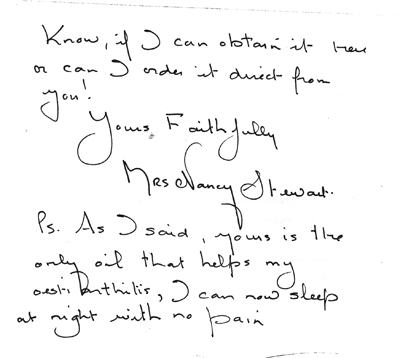 Our sales of the products, particularly the Arthritis Cream, have been encouraging. 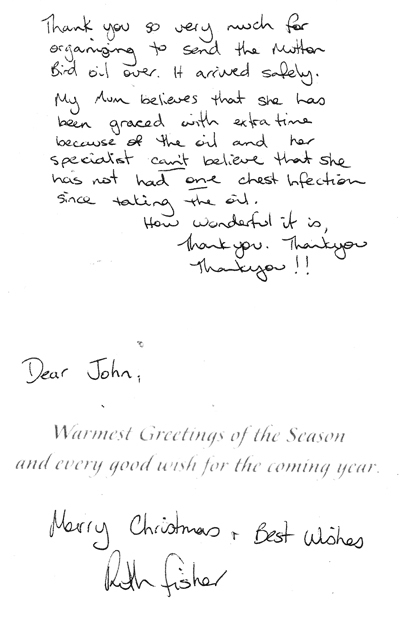 Feedback has been positive from satisfied clients. We recommend these products to other therapists who are looking for a more natural effective massage lotion. Just thought I would let you know how wonderful I think your products are. My friend purchased some at the Tasmania Craft Fair the other day and was raving about how terrific it was. Well me being the sceptic, because I have severe osteo arthritis in my hip and usually nothing I try even reaches it to give it relief, tried your products of Sports Balm, not expecting very good results. I was blown away with how fast it worked and how long I had relief for ( approx 4 hours ) which is just not heard of for me. I have just purchased my first of many of your product today. I will be raving about your products far and wide forever. Thank you for giving me the only relief from pain I have had for 13 years. I have used all sorts of creams, even steroid creams and was taking anti-histamines each night to alleviate scratching in my sleep – have not had a tablet for the last 3 nights. I must say I am very impressed. As I live in NQ would it be possible to purchase the Eczema cream in 100g pots, and could you give me cost of same, if available. Thanks for your wonderful products. Can you provide me with the name and phone number of your agent/s in Queensland mainly in the Brisbane or Sunshine Coast area. I used your products and the relied is fantastic. I originally purchased your product through someone at Landsborough. During a holiday in Tasmania we heard that people who take muttonbird oil don’t catch colds, so as I’m in the latter stages of emphysema and therefore it’s important that I don’t suffer from any chest infections, I decided to give it a go. I found that after a time of taking muttonbird oil I not only hadn’t caught a cold but, I had more energy and I was able to walk a little further and do a little more, so both my general health and also my quality of life had improved. My recent purchase of muttonbird oil arrived safe and sound, thank you for packing it so securely for the trip to Cairns, and thank you for an excellent product. We have been sampling Ocean Omegas products for some time and have found them to be very good. We will be happy to sell the products in our supermarket as it is always better to sell genuine local products, especially health giving items, as is the case in this instance. We have much pleasure in endorsing this product and wish John Wells and crew all the best in their endeavors. As a Holistic Health Therapist I was able to try your sample of the above cream on my clients for their reflexology sessions and foot massage. My finding was that it was a very successful medium to use and left my clients’ feet feeling quite “light and relaxed”. Their skin became smoother. I’d like to congratulate you on your efforts to introduce your wonderful product to the public and wish you all the very best in your continued endeavors. I was rather little disappointed to hear that product Arthritis Oil it’s not longer available to buy. The reason for inquiring about this wonderfully made product is because my elderly parents (from Greece) asked me on the phone a few days ago if there is anything better to relieve the constant pain and suffering associated with Arthritis and rheumatism. Having used this product and knowing the results of applying your Oil, I know it does work and gives relief to pain. I informed my parents about your little miracle Oil and promised to send them some as soon it becomes available. John I will Endeavour to help you and I thought by starting with this letter, and to anyone it may concern for what you are trying to do has a lot’s of benefits, does work, and I hope you have it on the market AS SOON AS POSSIBLE. 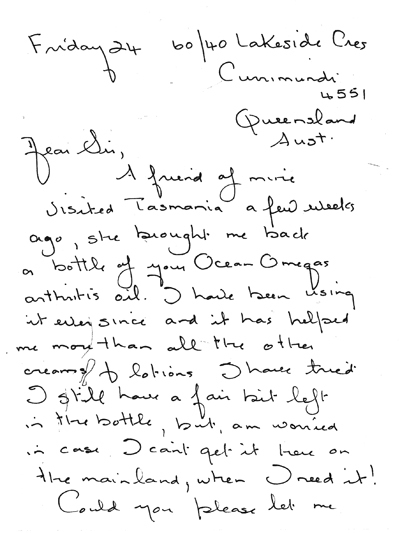 I am writing to make further enquiry as to when you may have your dry skin cream available for purchase. I have had very pleasing results from the trial to the sun damaged skin on my hands, arms, and face and am keen to continue using the cream. Would you please let me know as soon as product is available? Over the last two months I have used the dry cream and the Hand and Body Lotion (lavender) from John Wells with his muttonbird base creams. I have found them to be very good, as I have a very sensitive dry skin and I found them to make my skin soft and pliable. I recommend them and hope they can continue and be available to the general public. I was born with crickets and other symptoms which developed to serious illnesses through pre-teenage years. Juvenile arthritis was diagnosed early, Reynard’s Syndrome, sometimes blood in sputum from serious bronchitis, very weak heart, great joint swellings, stiffness and terrible pains. Nasty tonsils. Medications over that time did much to seriously damage my alimentary tract. Early teens I was given muttonbird oil, one tablespoon daily, and soon began to improve in all those areas. At age 18 I had improved amazingly, was able to play tennis, table tennis, ride push-bike, climb mountains, and jog long distances. In following years, I gladly advised other sufferers to use it, for conditions r.e. joints, cardiovascular, and body warming. Obviously animals benefited too, especially to prevent “bloat” in cows subject to lush clover grazing. Its penetrating ability is seen obvious to those who take it orally, as it will begin to exude from skin on many people and animals. One famous old blacksmith used the old oil to plunge-temper steel tools. To my knowledge, all who persevered had sensational benefits, from shingles, gout, emphysema, asthma, sarcoid, endocrine, Reynard’s, pneumonia, T.B., tachycardia, and eczema. Unfortunately, the doctors and chemists who appreciated this marvelous oil died out, being replaced by pharmaceutically-seduced practitioners who labeled it old-wives tales, quackery, and unscientific. When we see such little true benefit and such side effects of their rigidity tested, constantly changed alternatives, one wonders at what scientific efficacy really means. People all over Australia, still search to find a source of the oil. Since SCIRO research has established its superior omega 3 rating, it can no longer be debunked and I am thankful to have lived long enough to see this king of oils being restored to its well deserved position which cannot be overlooked or equaled. P.S. My mother was told my future was very bleak, so I am thankful to be above average fitness at present age, 78. Hello, my name is Anne and I was given a jar of your Arthritis Cream to try. This cream is just magic. I am very happy with the results and will be ordering more in a few weeks time. Would you have any skin pigmentation cream or discoloured skin cream? Please let me knoww as I will be interested in these.